50 monitors FREE forever Buy Now! and get notified ASAP if something goes wrong! Monitors from an application template perform in-depth checks of a particular type of servers and applications. You can easily create and maintain monitors from an application template. More than 10 alert types for user notification about network resource issues. Program can send email, SMS or instant message, can play sound. There are a couple of alerts for autorecovery (scripts). 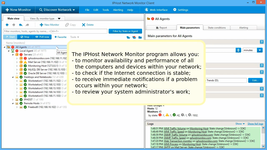 IPHost Network Monitor can monitor distributed networks. Install Remote network agent in every subnet and you can monitor them using each monitoring method supported. You can install IPHost Network Monitor in less than 2 minutes. Program is easy to use so you can configure your monitoring system quickly using network discovery and other wizards. 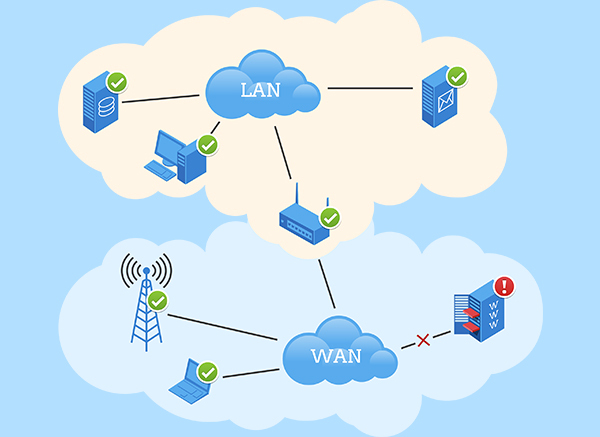 The most reliable alert (notification method) – just connect phone or GSM modem to computer with IPHost Network Monitor and you will get SMS about issues in your network fast and reliably. Simple to comprehend vizualization of monitoring events. You can see all major monitoring events, trends in monitoring state, for time interval of your choice. IPHost Network Monitor is bulletproof stable and can work for years without ever crashing. It’s a small standalone application and it requires no dedicated server but standard computer (PC) in most cases. 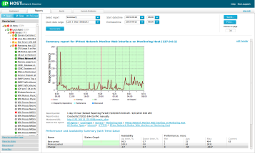 More than 40 supported monitoring methods: starting from PING till SNMP and WMI, including traffic monitoring. Excellent web monitoring abilities: you can check one page with HTTP request or page sequence with Web Transaction monitor. 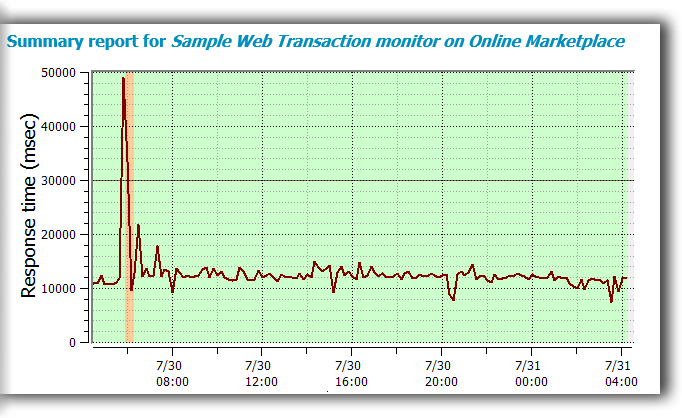 Web Transaction Monitor helps you to understand real user experience issues with your web application. It can simulate the whole page sequence required to perform some business operation, for example checkout in online shop. You can create monitoring setup so that you will get notifications on performance and availability levels you need. It lets you to get alerted on issues before they become problems. With network discovery wizard you can find network hosts and start monitoring of their resources. Discovery can be scheduled to start on schedule. You can set discovery for each remote network agent. All primary functions of watching and controling monitors on easy to use dashboards. Quick and efficient way to view reports, start and stop monitors, and watch alerts. Download MIB files from our online database of MIBs with description of all OIDs. Simple but effective ways to monitor availability of remote server. With TCP and UDP monitors you can check network service on any port. You can check mail servers using IMAP, POP3 or SMTP. All monitors can authenticate, SMTP monitor can actually send a message. With Windows service monitor you can check service presence. Available disc space and file size can also be monitored. Native monitors for Oracle, MySQL, MS SQL. Other databases can be monitored using ODBC driver. 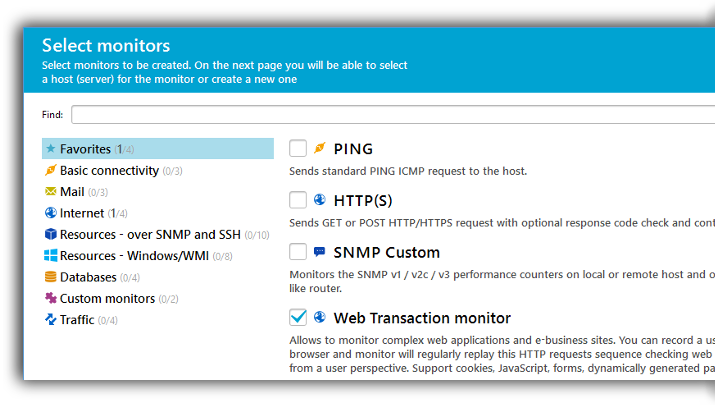 Industry standard monitoring methods for any server/device (SNMP) and for Windows computers (WMI). Trafic monitoring is also supported. Monitoring of web site or application user experience. You can record a multi-step sequence of web pages and monitor will test it regularly. Scripts and programs can be run on local computer or remotely using SSH. It allows to create any monitor for any device. You can also use Nagios plugins as scripts. Clipit.nl is a media monitoring solution for online, social and print media. We have a lot of legacy applications running in the background to gather and process relevant news messages for our customers. We are using IPHost Monitor since 2010, and found it a very stable solution. We have extended IPHost Monitor with several custom plugins, in order to monitor both server and application health, with more than 200 automated checks. When all monitors are up, we’re really confident about our on quality of service. Total number of 1879 monitors, 710 active. Track every API device, a three building campus. Mostly just track ping for ping for active devices, so disk space, mail servers, HTTP (a couple of web servers), some FTP sites, SNMP traffic speed to specific PCs. Need to be able to trust. I have 100% trust that it’s telling me the truth. It’s stable. If I do not get emails, I suppose it’s ok. It truly has been a very useful piece for our environment, we have it always live on a huge TV so everybody can see it. I’ve been working in IT support industry since 1994. Used SolarWind in the past. It’s little bit too much what we wanted. After WhatsUp Gold and more recently NetXMS, but it needed frequently restarting. IPhost runs scripts. IPhost is stable. It allows us to react quicker. It’s proactive, rather than active. We run 91 monitor, adding one at a time manually, without ever even using Network Discovery, checking .exe’s running on the servers, a lot of basic checking. Email alerting is the main method, it’s 24/7 even if are home. We carry Android phones to get alerts instantly. The most common notification method. You can specify up to two mail servers for email notification delivery. The most reliable notification method. Connect GSM/CDMA phone or modem and you will get SMS fast and reliably. Pop-up message window in Windows tray. You can enable/disable such messages in one click. Use this audible notification method when you need to hear that something has happened. You can use any mp3 or WAV file. When you on the go and want to get SMS. Depends on your provider’s email2SMS gateway. Select your provider and enter the phone number. Autorecovery or any other type of alert you need. You can run script or program locally or remotely via SSH. This is another sample of autorecovery alert. For example, sometimes you may need to disable or enable some port on a router. Use this notification when you need to get it anywhere and on any device you have. Q: I wish to receive SMS when site is down. Q: Will I be able to monitor Linux server? Q: Can I check my Web site availability with your software? Q: Shall I manually enter all the hosts in my network?